← Why are Barbara Stanwyck’s papers at the AHC? Because we asked for them! The use of social media in Wyoming and national campaigns and politics is the focus of two dialogue events Nov. 14 at UW. Both discussions are hosted by the Malcolm Wallop Fund for Conversations on Democracy, the American Heritage Center, and the UW College of Arts & Sciences. The public is welcome to attend both events and pose questions to the speakers. Kristen Landreville, Assistant Professor in the UW Department of Communication and Journalism, and her students will present results from their ongoing study “Small Town, Big Election: A Look at New, Alternative, and Emerging Media Sources Used by Rural Residents in the 2012 Presidential Campaign” at 2:30 p.m. in the Wyoming Union’s Family Room. Landreville and the students are surveying Wyoming residents to determine their use of online technology for political purposes and why they are engaging with these media. They are also being questioned about their use of emerging technologies and alternative media compared to more traditional sources, and how these new media sources influence their attitudes and perceptions about their trust in government. 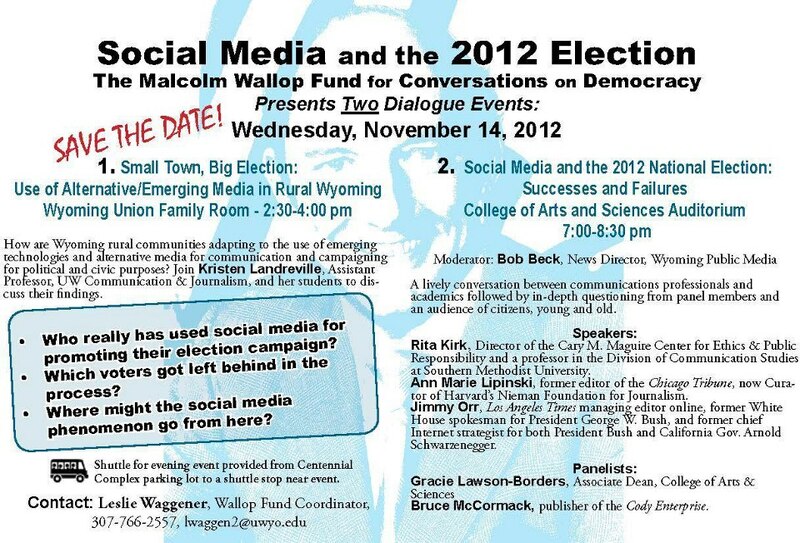 Next, the Wallop Fund is sponsoring a discussion titled “Social Media and the 2012 Election” in the A&S Auditorium at 7 p.m. It will focus on the successes and failures of social media during the 2012 national election. Wyoming Public Media news director Bob Beck will moderate. Speakers include Rita Kirk, director of the Cary M. Maguire Center for Ethics and Public Responsibility at Southern Methodist University; Ann Marie Lipinski, former editor of the Chicago Tribune, now curator of Harvard University’s Nieman Foundation for Journalism; and Jimmy Orr, Los Angeles Times online editor and former chief Internet strategist for both President Bush and California Gov. Arnold Schwarzenegger. The speakers will address such questions as: Who really has used social media for promoting their election campaign? Which voters got left behind in the process? What are the dangers, if any, of social media playing a major role in an election? Gracie Lawson-Borders, Associate Dean of the UW College of Arts and Sciences and social media researcher in the Department of Communication and Journalism, and Bruce McCormack, publisher of the Cody Enterprise will question the speakers and offer their own insight on the topic. This entry was posted in events, western politics and leadership. Bookmark the permalink.